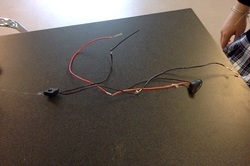 Project Description: It is a C for Cara and it lights up. Getting the wires to work because sometimes they wouldn’t connect correctly and I would have to start all over. I started over and played really close attention. I had never used a solder before and it was really cool. Project Description: It is a mirror with lights on the edges and it looks like it is an ongoing hole. Figuring out how many layers we wanted the cardboard to be. What was the most fun? I had a lot of fun when assembling it because we saw the mirror going into place. I learned about cutting the LED strips. What would you change? : I would find a way to make the led reflection longer.